Like the robotic rovers Spirit and Opportunity, which wheeled tirelessly across the dusty surface of Mars, a new robot spent most of July traveling across the muddy ocean bottom, about 40 kilometers (25 miles) off the California coast. This robot, the Benthic Rover, has been providing scientists with an entirely new view of life on the deep seafloor. It will also give scientists a way to document the effects of climate change on the deep sea. The Rover is the result of four years of hard work by a team of engineers and scientists led by MBARI project engineer Alana Sherman and marine biologist Ken Smith. About the size and weight of a small compact car, the Benthic Rover moves very slowly across the seafloor, taking photographs of the animals and sediment in its path. Every three to five meters (10 to 16 feet) the Rover stops and makes a series of measurements on the community of organisms living in the seafloor sediment. These measurements will help scientists understand one of the ongoing mysteries of the ocean—how animals on the deep seafloor find enough food to survive. 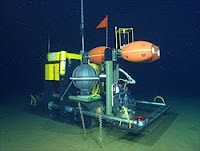 The Benthic Rover carries two experimental chambers called "benthic respirometers" that are inserted a few centimeters into the seafloor to measure how much oxygen is being consumed by the community of organisms within the sediment. This, in turn, allows scientists to calculate how much food the organisms are consuming. At the same time, optical sensors on the Rover scan the seafloor to measure how much food has arrived recently from the surface waters. Other engineering challenges required less high-tech solutions. In constructing the Rover's tractor-like treads, the design team used a decidedly low-tech material—commercial conveyor belts. After watching the Benthic Rover on the seafloor using MBARI's remotely operated vehicles (ROVs), however, the researchers discovered that the belts were picking up mud and depositing it in front of the vehicle, where it was contaminating the scientific measurements. In response, the team came up with a low-tech but effective solution: they removed the heads from two push brooms and bolted them onto the vehicle so that the stiff bristles would clean off the treads as they rotated. The team also discovered that whenever the Rover moved, it stirred up a cloud of sediment like the cloud of dust that follows the character "Pig-Pen" in the Charlie Brown comic strip. This mud could have affected the Rover's measurements. To reduce this risk, the engineers programmed the Rover to move very, very slowly—about one meter (3 feet) a minute. The Rover is also programmed to sense the direction of the prevailing current, and only move in an up-current direction, so that any stirred-up mud will be carried away from the front of the vehicle. In its basic configuration, the Benthic Rover is designed to operate on batteries, without any human input. However, during its month-long journey this summer, the Rover was connected by a long extension cord to a newly-completed underwater observatory. This observatory, known as the Monterey Accelerated Research System (MARS), provided power for the robot, as well as a high-speed data link back to shore. Later this fall, the Rover will be sent back down to the undersea observatory site in Monterey Bay for a two-month deployment. Next year the team hopes to take the Rover out to a site about 220 km (140 miles) offshore of Central California. They will let the Rover sink 4,000 meters down to the seafloor, where it will make measurements on its own for six months. The team would also like to take the Rover to Antarctica, to study the unique seafloor ecosystems there. The Rover may also be hooked up to a proposed deep-water observatory several hundred miles off the coast of Washington state. In addition to answering some key questions of oceanography, the Benthic Rover will help researchers study the effects of climate change in the ocean. As the Earth's atmosphere and oceans become warmer, even life in the deep sea will be affected. The Benthic Rover, and its possible successors, will help researchers understand how deep-sea communities are changing over time. Just as the rovers Spirit and Opportunity gave us dramatic new perspectives on the planet Mars, so the Benthic Rover is giving researchers new perspectives of a dark world that is in some ways more mysterious than the surface of the distant red planet.